Which is the better tablet: Apple's iPad 2 or the Lenovo ThinkPad Tablet? Apple's iPad 2 may be flying off the shelves, but the launch of the Lenovo ThinkPad Tablet (available in September) makes for an interesting battle. Though it's yet another Android tablet, the Lenovo ThinkPad Tablet is one of the first that will be targeted directly at business and corporate users. Read our comprehensive iPad 2 review and Lenovo ThinkPad Tablet preview, and check out our guide to the best upcoming tablets in 2011. The Lenovo ThinkPad Tablet is equipped with a 10.1in touchscreen and runs the latest version of Google's Android 3.1 'Honeycomb', software, but Lenovo's included digitiser pen and optional keyboard portfolio carry case that makes it an interesting proposition. With this in mind, how does the Lenovo ThinkPad Tablet stack up against the iPad 2 when it comes to specifications? The iPad 2 is faster, thinner and lighter than its predecessor. The iPad 2 is 33 per cent thinner than the original iPad, weighs 613g, and comes in both black and white models. The curved design of the back of the iPad 2 makes it comfortable to hold, and it is relatively thin given the size of its screen. The iPad 2 is ideal for use in either portrait or landscape layouts, and its built in accelerometer rotates quickly and without delay. The Lenovo ThinkPad Tablet possesses a thick design that intends to mirror the Lenovo's ThinkPad range of business notebooks. Weighing 715g, it's heavier than the iPad 2. The ThinkPad Tablet has square, sharp edges, and physical shortcut keys below the display. The buttons are large and easy to press, and we much prefer them over the software buttons on most other Android tablets. The Lenovo ThinkPad Tablet definitely feels a little heavy and chunky, but the weight isn't overwhelming. We particularly like the rubber-style finish on the sides and rear, which doesn't attract fingerprints. 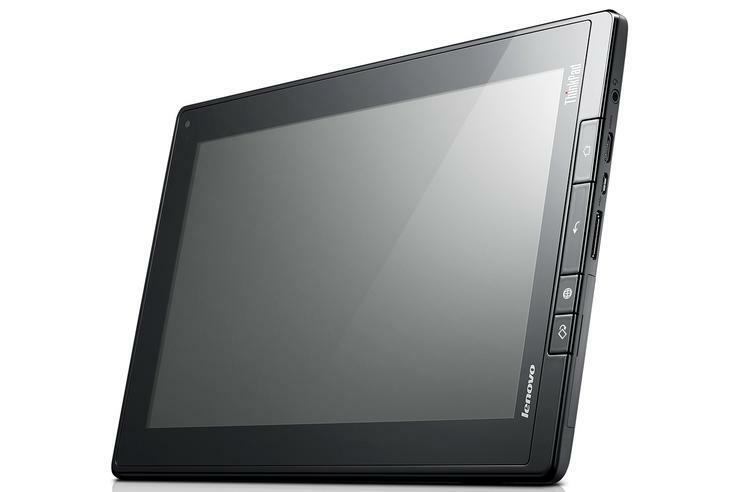 The Lenovo ThinkPad Tablet has a thick design that intends to mirror the Lenovo's ThinkPad range of business notebooks. It has square, sharp edges, and physical shortcut keys below its display. The 9.7in display of the iPad 2 is bright, crisp and clear and really brings content to life, particularly photos and videos. Though the iPad has the same oleophobic screen coating as the iPhone 4, its larger size means a few taps on the display quickly results in a grubby mess that is hard to clean. The iPad 2 also has another serious flaw — its display is virtually impossible to see in direct sunlight, which is a huge issue on a device that's designed for portability and travel. The Lenovo ThinkPad Tablet has a slightly larger display at 10.1in, and its resolution of 1280x800 pixels is an improvement over the iPad 2's 1024x768 display. Being a business tablet, we wish Lenovo opted for a matte screen on the ThinkPad Tablet, which would have made it much easier to view in direct sunlight. Lenovo says the use of a glossy screen is due to the fact the display is manufactured with gorilla glass, and this wouldn't have been possible with a matte finish.